Kathleen Leslie: Lochgelly High School - What Happens Next? At the start of this week pupils at Lochgelly High School were informed that their only Computing teacher had left the school. Read that again - their only Computing teacher had left. Pupils and parents were informed via a letter issued by headteacher, Carol Ann Penrose, that the subject could no longer be offered (the letter and all its grammatical tragedies is posted below). 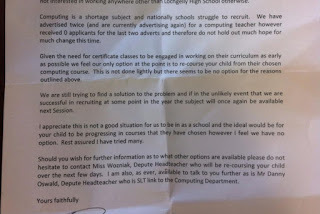 The letter reads that the school has advertised twice already and "does not hold out much hope for change this time". Was the memo on trying to promote feelings of well-being in the learning process missed by Ms Penrose? This was what the young people of Lochgelly and their parents were presented with as they returned to school after the Summer recess. This is also the Scotland in which SNP MSP, John Mason claimed that society had "moved on" from the need for literacy and numeracy skills. Just think about that. That from an elected representative of a party in which education is claimed to be their "number one priority". Now lets return to Fife and teacher recruitment. In March 2017 there were 259 vacant posts in Fife, no doubt, in part due to the national shortage. However, it does raise questions about how robust a recruitment policy the authority actually has in place. As a former teacher I am well aware of the amount of teachers working long-term on temporary contracts and quite often as supply staff with no contract. Yes, it does happen, I have friends who have been in that situation. Week after week, month after month, no contract. Interestingly that leads back to a row that brewed up and led to a fine spat between the then Labour run Administration and their SNP opponents earlier this year over a £3 million cut to the education budget. A cut that was apparently not a cut...Well in the view of the Administration it was not but that was due to an underspend in the education budget - yes, an underspend in education whilst I know of schools where staff were told not to photocopy due to there being no money... That discussion is for another post and I can provide a link to one of my colleagues who wrote a fantastic post on this (just let me know). However, that £3million debate has all gone strangely quiet post May this year. We don't talk about that now. As of last month Head of Education Services, stated "As well as recruiting new teachers we have also reviewed school rolls for the year ahead and transferred some staff to best match the needs of schools across Fife". Well they certainly didn't manage that with Lochgelly High School, did they? Returning to the case in point, how on earth did Lochgelly end up in this position to begin with? One Computing teacher - only one in the whole school? Which leads to the bigger question - how many other schools across Fife are sitting on this potential situation? How many schools only need that one teacher of a curriculum subject to leave and would they be left with a situation where no one was available to take on the classes? Only 2 years ago I remember another school (which shall remain nameless) whereupon the retirement of a Home Economics teacher and failure to replace (despite said teacher making the local authority aware of upcoming retirement) meant a gap within the timetable and the pupils who immediately missed out were those within the Department for Additional Support (DAS). Clearly not considered to be a priority their weekly class was cancelled (I will write about the provision of subjects available for pupils with additional support needs in another post as that is a topic in itself and one that needs addressed) and supply and other subject staff were brought in to cover the gaps. Lochgelly High is a diverse, truly comprehensive school in an area that has seen, and to some extent continues to be an area, with high levels of deprivation. It is a school though that has seen an increase in success in national qualifications, S1 winning in the Regional Dance Championships, S4 pupils who passed the First Chances Programme and an excellent DAS (the proviso of education for pupils with additional support needs within mainstream schooling is something Fife can be proud of and is something that many other local authorities in Scotland should be looking at working towards). It has much to be proud of but it needs a Computing teacher. In this digital era where so many college places and jobs need well developed IT skills this is quite unbelievable. What is to happen to all those pupils who have selected their National and Higher course choices? As if the situation was not bad enough for all the new S1 pupils what of those who require a qualification in Computing for the college or university place they may be currently working towards? What is to happen to them? Are these pupils just to just "re-course" - by that I assume Ms Penrose means to send these pupils off to another subject. A subject they did not choose to study, probably because Computing was going to be more suited to the choices they are making for their future post-school studies or career. What then are these "robust" recruitment policies that Fife Council's Education Service has insisted are in place? That is an answer that the pupils and parents of Lochgelly High School who have been directly affected as a result of the loss of their Computing teacher need answered. Immediately. I have some questions I will be asking of the Education & Children's Services Committee when it meets next week. Below is the press release that I issued yesterday. 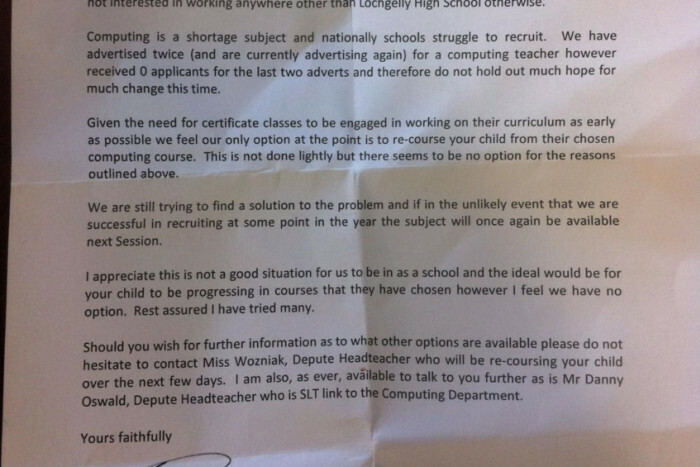 "The loss of Lochgelly High School’s only Computing teacher is a shocking indictment of a haphazard process of recruitment by Fife Council that has been at best short sighted and at worst showing not to care about the education of young people. Computing is a crucial subject for all pupils in the digital era and for no measures to have been put in place to ensure this did not happen is simply not good enough. Recently we have been hearing a lot about the need for rezoning of schools in parts of Fife but next to nothing about staffing issues. What is to be done about this? The Council needs to either transfer staff from another school or look urgently at ways to bus youngsters who are planning to study for Nationals or Highers in Computing to other schools within the area. This is quite simply unacceptable and raises a number of questions about teacher recruitment in Fife. None of this is of course helped by the fact that there are now 4,000 less teachers since the SNP came to power a decade ago. I will be raising this at the Education and Children’s Services Committee which meets next week." The letter issued to parents. Labels: Lochgelly High School - What Happens Next?